Arle, a little village in East Frisia, northern Germany. If you have never heard of it before, don’t feel bad. I’m German, and neither had I. Arle has about 1.000 inhabitants, according to Wikipedia, so anyone living more than 20 kilometers away was unlikely to have heard of it a year ago. Now, things are different, and Arle has become famous with boardgamers all over the world, thanks to Uwe Rosenberg’s game Fields of Arle (German: Arler Erde). For Rosenberg, the game is a bit of autobiography: Arle is the birthplace of his father, and he himself was born in Aurich, about 20 km away and also featured in the game in a supporting role. 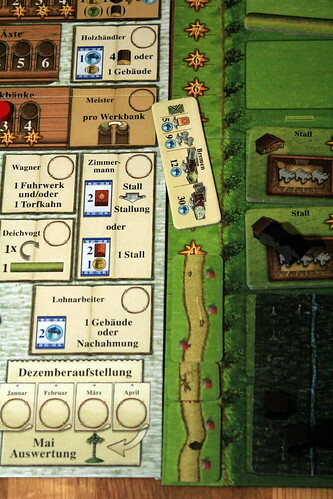 Fields of Arle goes back to the glory days of Arle, back in the Middle Ages, when the village was still not very big, but among the most prosperous in Frisia because of the quality of flax grown there. You, the players, take Arle from it’s humble beginnings as a literal One-Horse-Town (one horse being what you get in game setup) with a single flax and wheat field each and a whole lot of marshland around to its rightful place as a textile metropolis. If you don’t starve first, which is a real possibility in Fields of Arle. 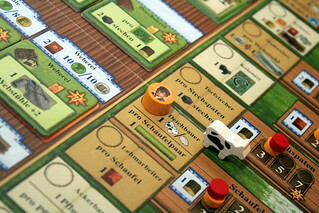 The basic mechanic, Fields of Arle uses worker placement. Over 9 rounds – 5 summers and 4 winters – you send your four workers to improve the village in many different ways. The first big question about the game is, or at least it was for me when I first read about it, why is it a two player game? It’s an unusual choice for a worker placement game, since the rules for that type of game scale easily to four to six players. And indeed, there is only one rule in Fields of Arle that would have to change with more players. There is a compelling reason not to have more than two players: they would have to put wheels on the box and make a contract with IKEA to give discounts on really large tables, because this game is heavy and big. 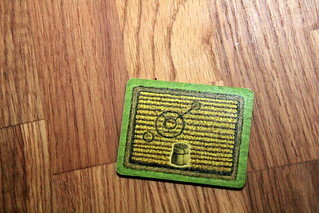 Next to the central game board – not overly big but not the smallest of its kind, either – there is a second board only for tile storage , and each player has a Home Board and a Barn Board on top of that. Plus goods tiles, building tiles, carts and carriages, cowple, sheeple and equiple (that’s equine meeple, because horple for horse meeple sounds too odd. The main worker placement action happens on the big shared board, with effects from there often applying to the player’s own boards. The available actions are completely different between summer and winter rounds, an important fact to keep in mind when planning your turns. For example, you can only cut wood in summer, but only bake bread in winter. Thematic doubts on that aside, it has a big impact on the game. Where other worker placement games might let you get away without a detailed plan for the next round, Fields of Arle is pretty merciless in that regard, some resources you will simply not find next round. Just collecting some resources and then seeing what you can do with them will not help you much, either. There are 15 different actions per season, and you’re dealing with 14 different resources, so don’t expect to accidentally have the right one available. Of the different actions, many use tools in one way or another. You have at least one of each type of tool available from the start, meaning you can immediately pick from all actions, but most actions are improved by having more tools. For instance, sending one of your workers to be a Fisherman, he catches one fish for each fish trap your village has. Alternatively, a Fisherman can build a new fish trap and, for unfathomable reasons, bring a sheep home. Yeah, some of the 15 actions per season still make you choose between two options how to use them. You won’t be lacking choices in Arle. Most actions let you take resources, either many of one type like the Fisherman or a potluck of resources, like the Grocer. (Here, have a brick, or would you prefer wood? Any type of animal maybe? Either way, I’ll put some hay and a bit of leather with it!) Other actions allow you to make changes to your Home Board. With the help of a Colonist, you can turn a marsh tile over, letting you cut peat from it (using another action) and finally remove it from your board. That opens up valuable building space and saves your from losing points at the end of the game. But mainly you’ll want the space. Another action lets you push your dikes forward, winning more valuable land from the North Sea and making it usable for your village. With all the space you should be freeing up, yet more actions let you grow your village and surroundings. More wheat fields, flax fields and forests produce goods at the end of the season. Stables of different kinds offer shelter to your animeeples where they can reproduce in spring. They can hang out in empty fields and even on the dikes as well, but they’ll only make more animeeples in a stable. Space in your villages can be filled with a wide selection of buildings, worth points when the game ends – a lot of points, in some cases – and other benefits in the form of resources when the building is placed or in the form of bonus actions. The above only covers actions concerning your Home Board, there are still some more to do with your Barn Board. The barn is where you keep your plows, carts, carriages and peat boats. Plows are used as tools for creating new fields, peat boats can trade peat against other kinds of resources, an easily underestimated ability. The remaining vehicles are all used for transport, differing only in their size and what goods they can load. They can be used in two ways. If you load them with goods, you can get them enhanced in the wide, foreign world of 10km away. You can send loam away and get back bricks, or have linen, wool or leather made into the corresponding type of clothes. Again, you’ll have to properly plan ahead, because your carts only return with the upgraded goods at the end of the season. Another way to use them is to send them to far away places like Aurich, Emden or even Bremen to sell goods there. Every city has different demands, each can only be approached once, and they invariably pay you in food. That tends to be less valuable later in the game, but in the first few rounds you’ll be thankful for all the food you can round up. Each city your people visited is also worth victory points, but you’ll have to do some serious traveling to make as many points from East Frisia tourism as you gain from other sources. Those other sources for points include almost everything: tools, goods, buildings, animals and manufactured clothes are all worth points, but that doesn’t mean they are easy to get in the limited number of actions you have. 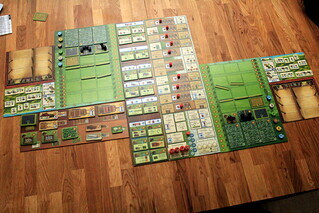 All this if, of course, only a rough overview over Fields of Arle. There are a bunch of rule details that would bore and confuse you here, and going into details about the different buildings would take up too much space as well. But you can see one important point: this is not a simple game. The rules are not too complex, they talk about many different options but each of those is very consistent, there are no exceptions to keep in mind. The hard part is to find your way through all the options. With that many actions to pick from, resources to juggle and buildings to choose from, finding the move you think will help you most can take a while. And since you have only four moves per season, you really don’t want to waste any of them on a less than ideal move. So you might spend a lot of time figuring out what to do next, only for your opponent to take the action you needed for your next turn, forcing you to start thinking all over again. Which is another reason not having more than two players was the right choice. Nine turns, each with four moves per player might not sound like much, but for the first few games you can forget about the two hours the package shows as playing time. Three hours plus seems more realistic, but too be fair games get a lot faster when both players have some experience. Imagine that with four new players, you’d need vacation days to finish. Fields of Arle is Uwe Rosenberg’s declaration of love to his ancestral home. You can tell how he wanted to put all the details about life in East Frisia into one box, all the things that make the village of Arle. The struggle against the North Sea on one side, marshlands on the other and trying to create a little center of trade from almost nothing. Putting all that in one game had a lot of potential to become an inconsistent mess, and its only thanks to Rosenberg’s skill as a game designer that it didn’t. 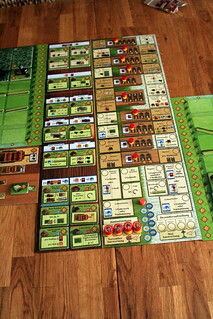 Even with all its options and different things to take care of, Fields of Arle is streamlined. The rules are consistent and with no exceptions. All buildings, travel destinations and so on are described in detail in the rulebook, not only as icons on the tiles. On the other hand, everything important is on the tiles and boards as well, you’ll rarely have to check the details in the rules after you learned the game. But they are there if you need them. All that, plus the high quality of components and the illustrations by Dennis Lohausen – easy to distinguish and mostly appropriately utilitarian, but with playful details like the crop circle on one wheat field – make Fields of Arle a very good game for its target audience. If you have the opportunity to play a long, involved game with only one other player, this is definitely for you. The second nominee for this year’s Kennerspiel des Jahres, Istanbul makes you run around the bazaar district of the titular city in a desperate search for rubies. Why rubies, you ask? No idea, to be honest, but as the game progresses it turns into a frantic search for your lost assistants, anyway. Leaving your assitants behind to work, then gathering them up again and leaving them somewhere else, that’s the core of Istanbul. In 2019, the Arctic is one of the few remaining areas on Earth with natural resources. Naturally, everyone with a claim on those, however slight it may be, want them. And so the fight for the Arctic begins. But only at first glance is it a conflict between nations – cooperations are the driving power.